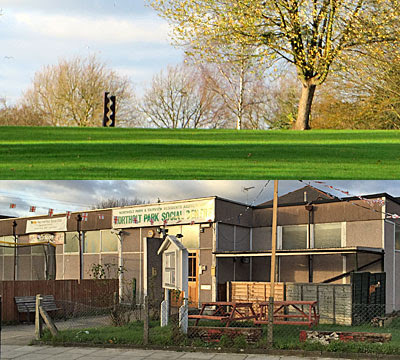 Though Northolt Park contains no eponymous greenspace, its recreational sensibilities are satisfied by the extensive amenity of Alexandra Park. Opened in 1928 on the site of the legendary Paddocks Pleasure Grounds, it was named after Queen Alexandra who frequently visited this delightful locale. Sinuous avenues of trees lead up the hill towards a verdant summit, where a notched sawtooth sculpture holds court and starlings roost. Bring a picnic from Mama's Kitchen or the Spicy Night Tandoori - the opening date for the organic independent cafe remains some time off - and spread out on the benches by the Millennium Garden. Some of London's finest breeds of dog can be found snuffling and squatting in the longer grass, while younger residents ride their bicycles from one gate to another enthralled by the possibilities created. Why slip up the road to South Harrow when everything a great day out needs is right here? The beating heart of everyday nightlife in UB5 can be found in the midst of the Racecourse Estate. For eight pre-war years these fields were a national centre for pony racing, with crowds flocking to the grandstands from far and wide to bet on four-legged frolics, before the council ploughed the lot and built thousands of houses instead. But that early buzz and excitement lives on at the Northolt Park Social Centre, whose drab prefab exterior belies the warm welcome offered within. Conveniently located just up the road from the Harvester and Travelodge, a full range of activities from Zumba to Taekwondo are offered on a regular basis. Or come for the Bingo, renowned in the locality from Goodwood Drive to the flats, every Wednesday and Friday evening from eight. Annual membership is excellent value at £15, and much coveted, because where else in London can you watch every BT Sport live football match simulcasted as it happens? The spirit of Ascot is alive and well at the NPSC. 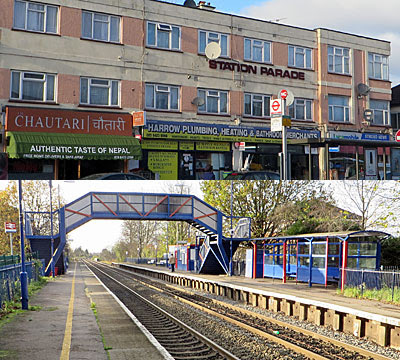 When discerning visitors alight in Northolt, direct from the Aerodrome or elsewhere, Station Parade should be their natural destination. This run of exquisite eateries and boutiques serves the local neighbourhood with aplomb, from Hollywood Pizza to the House of Elliott salon. The cuisine of the subcontinent is a particular speciality, with an Indian hybrid flavour brought to life at the Golden Sip restaurant, and the Chautari takeaway offering the authentic taste of Nepal. If all this has tickled your tastebuds, pop into the Everest Supermarket where you can recreate all your favourite dishes at the drop of a shopping basket. Or venture differently east at the Gucio Polish delicatessen - of course it's an off licence too! And if any hipsters feel the need to opt out there's a quirky Asda immediately adjacent to the funeral directors, because that's the way Northolt Park parties. But how to get to this outer London hotspot? The powers that be haven't made it easy, indeed some would say deliberately difficult, by restricting travel options to minimal service levels. Chiltern Railways, holders of the Bicester Village franchise, run just one train an hour to this zone 5 outpost - miss that and miss out! The station that bears Northolt Park's name is a brief halt between two streets, crossed by a footbridge that affords a glorious panorama of the surrounding rooftops. As one of the dozen or so least used stations in the capital, the pop-up ticket office is regularly staffed and of an especially atmospheric vintage. A padlocked portakabin in scarlet and blue, the interior is laid out with low occasional tables and some leaflets, while faded colour prints on the exterior depict happier days when the Green Arrow steamed through. Alight here for The Top Shop newsagents, and adventure. If your visit to Northolt Park has taken its toll, take a brief stroll south to the banks of the A40. 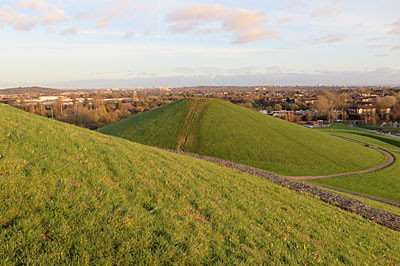 Here four huge conical mounds have arisen, seemingly inspired by Madonna's brassiere, their summits looming above the traffic on the silver thread of dual carriageway below. These sylvan hills date back barely a decade, constructed from the spoil removed during the reconstruction of Wembley Stadium, whose elegant arch resembles an ivory rainbow on the northwest horizon. Various footpaths curve around this quartet of grassy peaks, but only one spirals sufficiently to rise to the highest crown. Follow the gabions anti-clockwise, or use the wooden benches aligned as stepping stones, and pray that bitter winds have cleansed the summit of local riffraff. The view is genuinely one of the finest in west London, from Horsenden and Harrow round to Heathrow Airport, interrupted only by the occasional hovering bird of prey. And in the distance espy the City and the Shard, their retail and cultural delights impossibly out of reach, but when you have all of Northolt at your beck and call, why rush to leave?